CROWN JEWEL OF LODO LOFTS! Fabulous CORNER loft in top building. Northwest view of mntns & Highlands. Over 400 sq. ft. terrace: gas outlet for grill, water spigot & 220V for hot-tub. Walls of glass on two sides of this unit: true bedroom with operable windows and private master bathroom. Great floor-plan – very open, great natural light. Bamboo wood floors, granite kitchen counters and limestone master bath counters. Thermal insulated windows, 10-ft. ceilings, pre-wired speakers. Two blocks to the Train to the Plane and light rail to DTC. 1800 sq. ft. fitness ctr, Bus center, 24-hr lobby attendant 7 days a week. 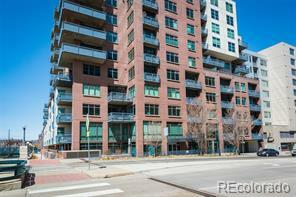 Waterside Lofts is renowned as a 10+ building in downtown Denver. Quick Possession!